You are here: Home>People>Village people>Keep us one jump ahead - if you spot his descendants let us know! You wonder if this little ‘fella’ had his own cabin on his trip to Bottesford from Australia. Peter and Peggy Topps kindly donated this photograph of Mr. F.B. 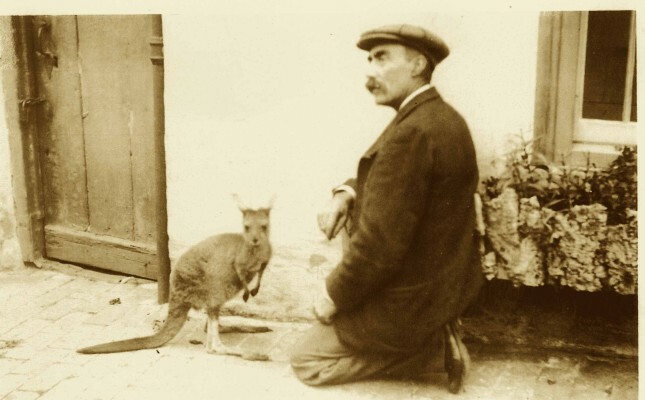 Lane with his ‘kangaroo’ (Bottesford, June 1908). Clearly before the times of quarantine controls. A news paper clipping from The Grantham Journal in Peggy’s and Peter’s possession tells us how Mr. Lane came to have access to an antipodean marsupial. Mr. F.B. Lane returned home at the beginning of this week from his trip to Western Australia, whither he went, for a second time, as a special adviser, in charge of a party of emigrants. He managed to secure an eight month old kangaroo and bought it home with him. On Tuesday afternoon he kindly brought the strange little animal to the schools, and gave the scholars an interesting address. We believe the animal in the photograph looks like a wallaby and not a kangaroo. The clue is the shape of the head. Apparently they can be kept as exotic pets in the UK (see www.wallabiesandwabbits.co.uk). Lets hope this little chap thrived in Bottesford. Or maybe s/he made the return journey and escaped the northern hemisphere winter weather. This page was added on 05/03/2014. Very interested in this photo as Frances Lane was my Gt Grandfather, one of his daughters Frances was my Grandmother who married Rowland Cooper son of John Thomas Cooper from Bottesford. Rowland came out to Australia and settled and married my Grandmother. I believe he met my Grandmother when they lived in Bottesford from 1903 to about 1910.